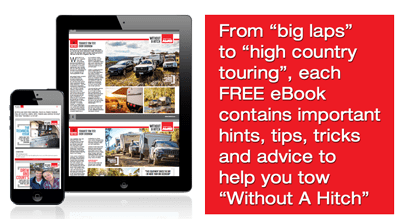 Here’s how to establish and maintain the correct pressures for your caravan’s tyres. 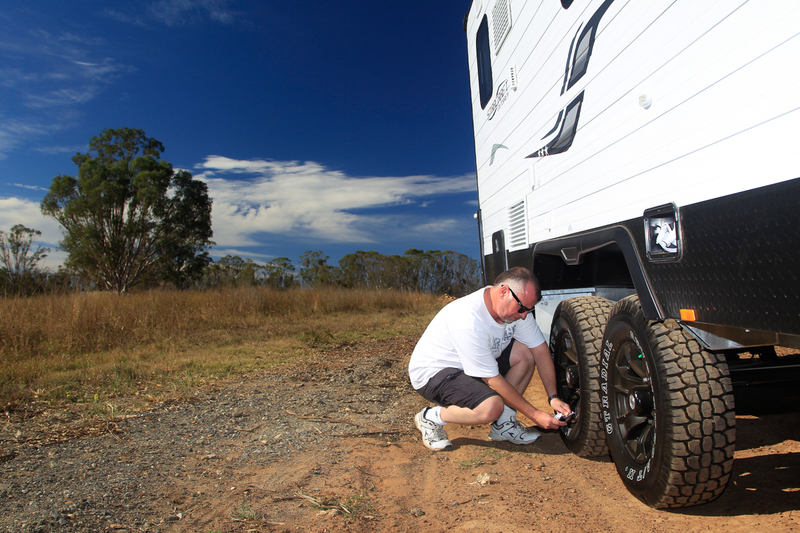 Maintaining correct tyre pressures on a caravan is vitally important. If the pressures are too high, the chance of puncture damage is increased because the tyre has less ‘give’ in it. The caravan can also become less stable, with less give in the tyre sidewall transferring more road shocks. This will create more opportunity for the tyres to loose contact with the ground and cause instability, leading to caravan sway and all the risks associated with that. With too little tyre pressure, the sidewalls will have too much flex which will also add to caravan instability. 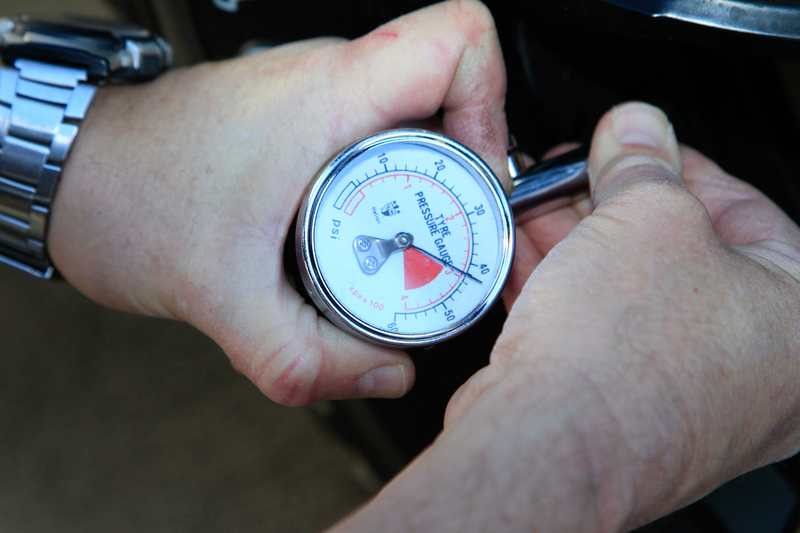 There is a simple way, however, to check that the tyre pressures you are running are right for your van. This method is widely accepted as sound, and it’s even endorsed by tyre engineers. The rule is this: for P-rated (passenger) tyres, there should be a 4psi increase from when a tyre is cold to when it is hot. For LT (light truck) tyres, there should be a 5-6psi increase. If the pressures increase by less, the cold pressure is too high. If you see a larger increase, then the cold pressure is too low. 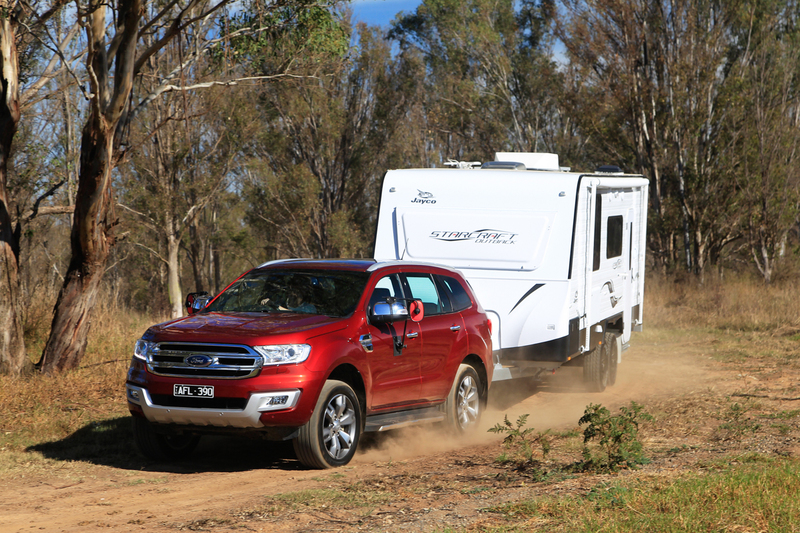 Most caravans are fitted with light truck tyres but some are passenger rated. The way to find the rating is to check the sidewalls. Look for the ‘LT’ marking, most often as a prefix or suffix to the tyre size. It may look something like 265/75R16LT. Passenger tyres will have the prefix ‘P’. An example is P205/75R14. Caravans have a compliance plate, which is usually fitted to the front/tunnel boot, on the A-frame, or inside the entry door. Amongst other things, the compliance plate has a recommended cold tyre pressure for that van. You should use that as your starting point, assuming that the tyres fitted to your van correspond with the size and construction noted on the compliance plate. 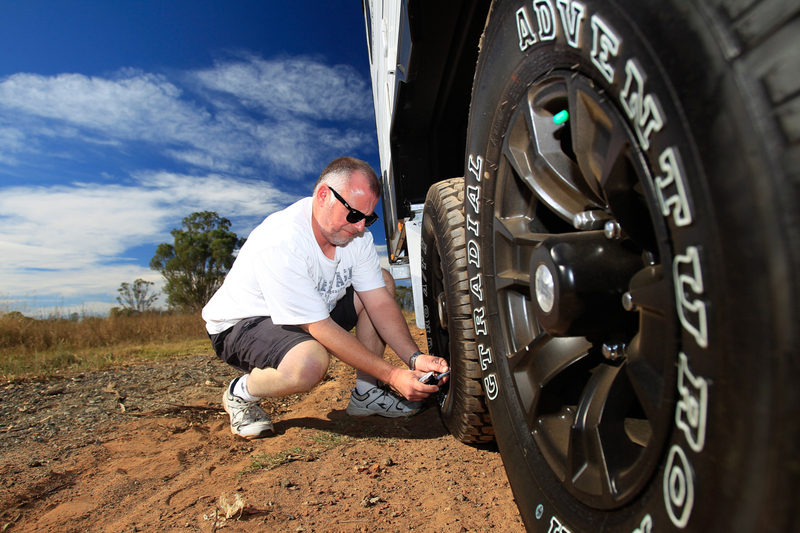 With a good quality tyre pressure gauge, check each tyre on the caravan before a trip. The tyres must be cold; that is, a good couple of hours since the van has been towed. 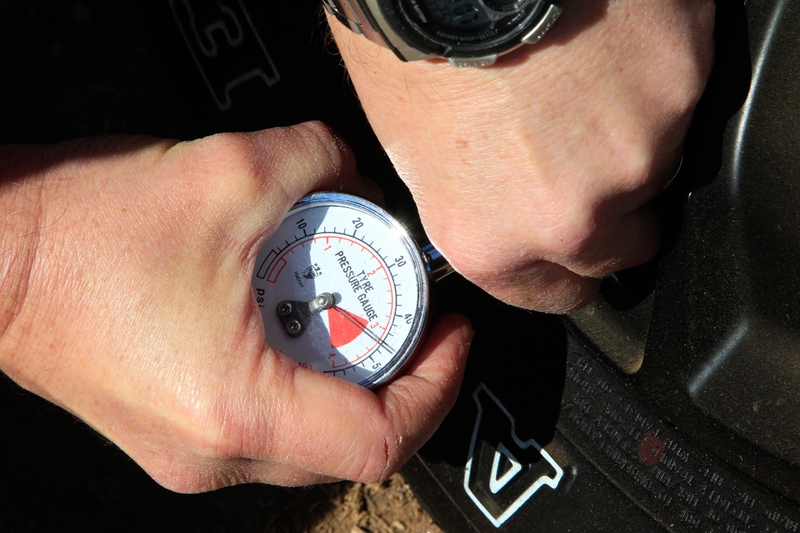 Inflate or deflate the tyres to match the cold tyre pressure recommended on the compliance plate. Tow your van for at least 30 minutes (preferably an hour) at highway speeds (90km/h to100km/h) and the re-check the pressures in each tyre. Heading off on a trip is the most convenient and realistic way to do this, with the van and vehicle’s payload on board. When you have found somewhere well clear of the highway to pull over, such as a service station, get out your tyre pressure gauge and see what the tyre pressures have risen to with some heat in them. If you’ve got the 5psi-6psi rise in pressures (for LT tyres), your cold inflation pressure is spot-on. If you have less than this, then the cold pressures are too high. If you see an increase of more than 6psi, the cold pressures have been set too low. You should not see a large variation from a 5-6psi increase from cold to hot LT tyres, so you can make small adjustments when the tyres have not been rolling for a couple of hours. If you see only a 2-3psi increase, then let out 2psi and check the pressures again after an hour of driving. You should soon have the correct 5-6psi increase. For a minor increase over 5-6psi (up to 8-9psi), then add 2psi to the tyres and check them again after another hour or so driving. If the tyres have become much hotter (+10psi), then you might have a more serious problem, such as a faulty tyre, dragging brakes or faulty bearings.